It’s pear-like shape and rough, green skin resembles an alligator. In 1961 my family celebrated our 10th anniversary of being Naturalized Citizens of the United States. At this time my father sold our first small home and bought a bigger one in a very nice neighborhood in Glendale, California. I was still in college and lived at home. My little bedroom was decorated with pink and white bedspreads and white curtains that covered the two windows looking out onto a small back yard. My desk was in front of one of those windows and when I sat there studying my eyes always wandered out to the big tree that shaded the house. Through the seasons I never saw it bloom, but during the summer it bore some strange fruit that we did not recognize. It looked almost like a pear, was dark, almost black in color,and when we picked it, and cut it open, the flesh was pale green with a huge seed inside it. We had no idea what to do with this fruit. We let it fall to the ground, collected it, and put it into the trash. Some evenings at dusk I would see raccoons tip-toe around the garden picking up and eating this strange fruit that fell off the tree. It was many years later in a restaurant that I was urged to choose a salad, “Hearts of Lettuce with Guacamole” and it was delicious. When I asked what that green “vegetable” was I was told that it was an Avocado. As it was being described to me, I realized that it was the fruit of our backyard tree, while all these years we had thrown away this delectable fruit and had no idea that it was edible. Since then, and for many years now the Avocado is one of my favorite fruit. It grows on a tree of the laurel family! In all my reading about the history of the Avocado, the researchers differ in some respects of its origin, however, most of them seem do agree that it originated in the South Americas. It was Hernandez de Oviredo who discovered the Avocado in 1526, and research shows that it was highly regarded by the Mayas and Aztecs. The original name was awa gualt which then in common usage, in the Spanish language, became Avocado. 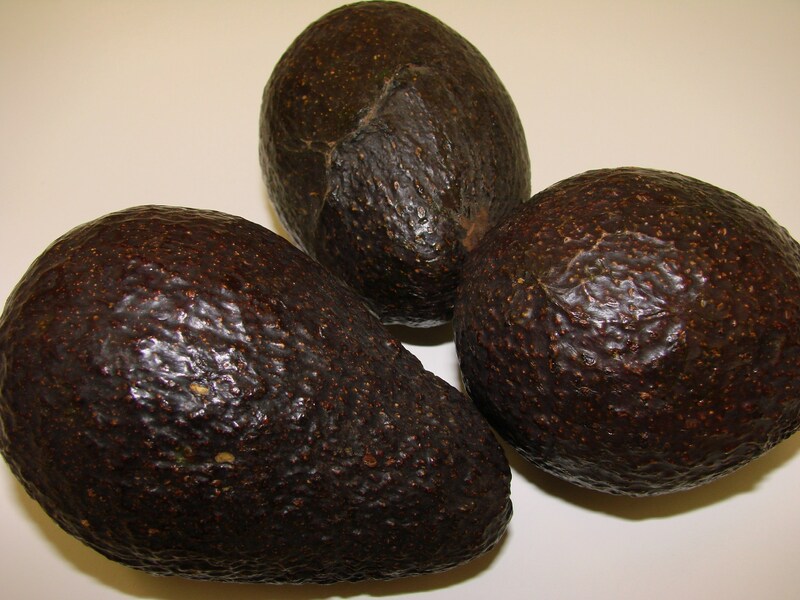 In 1653 horticulturists described that the many types of Avocados came from three races, all indigenous to Mexico. 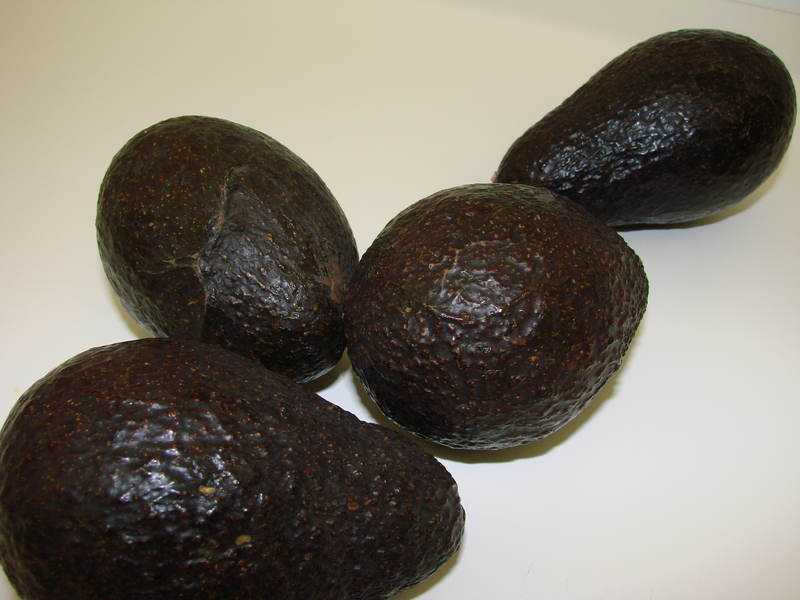 They were recognized as West Indian, Guatemalan and Mexican Avocados. Today most of the cultivated Avocados are grown in Florida and California. In Florida we find the West Indian-Guatemalan, the Fuerte, and in California the Guatemalan-Mexican, the Hass. The Hass Avocado is named after Rudolph Hass, a mailman from Wisconsin who retired in California and patented the tree in 1935. The Hass grown fruit is rich in oil (18 to 30 %), is small and dense, has a green-black “alligator” skin. 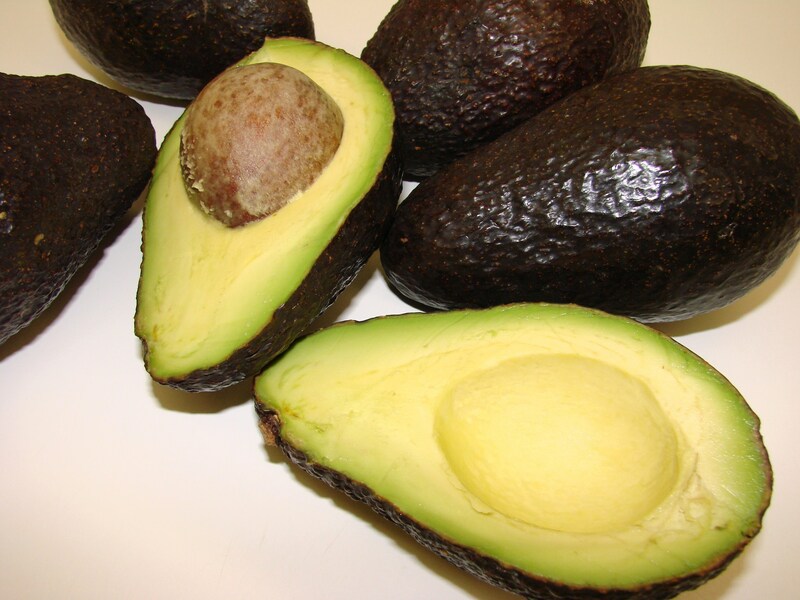 The fruit has a nutty and buttery flavor and is much smaller than the Fuerte Avocado. In Florida there are about 60 different Avocado varieties. Generally the Florida Avocado is juicy, not buttery and has about 3 to 5 % oil and their flavor is mild and fruity. The Florida Avocado can weigh from one half pound and up to 5 pounds and can be as large as a football and has a skin that stays a smooth and leafy green. Most of the Avocados are best when ripened off the tree. To buy them in the grocery store chose one that is heavy for its size, and yields to gentle pressure. To speed ripen them, place several Avocados into a paper bag and let them sit at room temperature for a couple of days. When the Avocado is cut the flesh will darken once it is exposed to air. 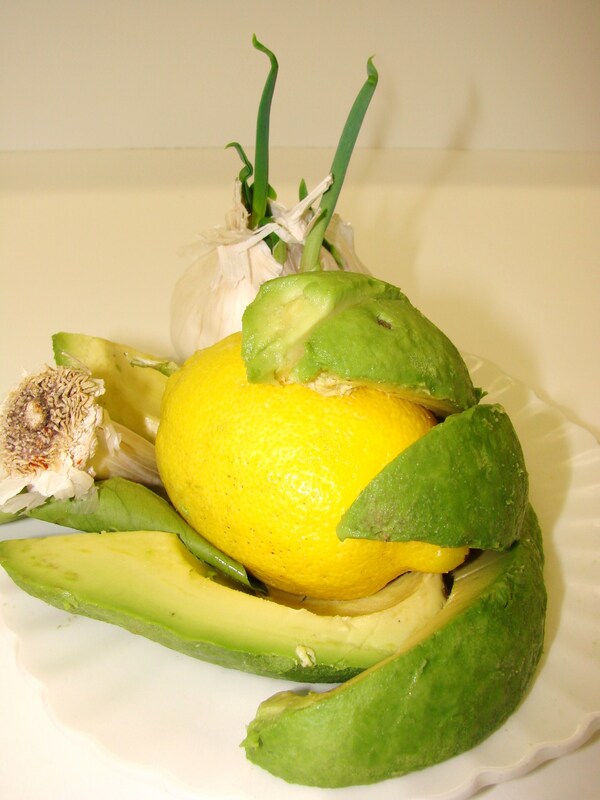 Pouring or rubbing little lemon or lime juice over the fruit will eliminate the discoloration – somewhat. Once mashed to a puree in preparation for a dip it is NOT TRUE that burying the avocado stone in the puree will help maintain the fresh green color. Recently recipe preparations using avocados have become a little more imaginative. Due to the awareness for healthy eating, the Avocado has become quite popular. However the guacamole is probably still the most loved! The Avocado contains important nutrients, such as lutein, which promotes eye health; vitamin E an antioxidant; and potassium a component without which the body’s electrolytes would not be balanced. The little fat it contains is mono-unsaturated, which some studies say helps lower LDL, the “bad” cholesterol. that will get you in the mood for spring! By Mary and Vincent Price – Vincent Price, the famous move star, was a frequent visitor at Immaculate Heart College in Hollywood, California where I spent four years studying Biology. I, and my friends on campus were so in “ah” of him! Mash the Avocado with a fork. Blend in the remaining ingredients except the mayonnaise. Spread the mayonnaise over the top of the mixture to keep it from darkening. Refrigerate and when ready to serve, blend in the mayonnaise. Serve as a dressing on Hearts of Lettuce or use it as a dip. Peel the Avocado. Dice and sprinkle it with lemon juice. Slice washed scallions very thin. Wash radishes and grate them coarsely. Combine Avocado, scallions and radishes lightly using two forks. Serve on a bed of lettuce with the French Dressing. Combine all ingredients in a blender. Makes about 1 ¼ cups dressing. Cut avocados in half lengthwise and remove seeds. Combine chicken or crab meat, celery, cucumber, olives and mayonnaise. Mix lightly. 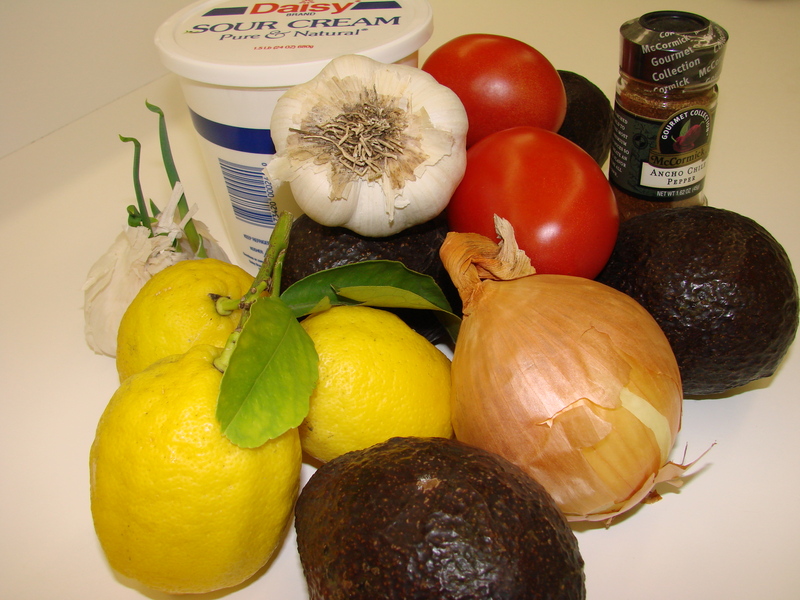 Place Avocado halves on a bed of lettuce and fill the avocados with the salad mixture. One can substitute the chicken with crab, lobster, or tuna. By Joseph Pasternak a famous Hollywood producer. 1 cup creamed cottage cheese. Mix all ingredients in a bowl and serve as a dip/spread with Melba toast or crackers. This was my favorite Kitchen Store in Baltimore when we moved here in 1981. ¼ tsp garlic powder or 1 to 2 fresh garlic cloves – finely chopped.. Put all ingredients into a bowl and mix gently. Place the sugar in a bowl, large enough to hold the walnuts and have a heatproof rubber spatula ready. Place a strainer in the sink for the walnuts. Nest a clean, dry wire-mesh strainer inside a bowl and place near the stove. Coat the bottom of a rimmed baking sheet lightly with vegetable oil spray. In a 4 quart pan bring the water to a rolling boil add the walnuts and boil for just 1 minute. Remove walnuts and shake them dry in a towel. Transfer them to the prepared sugar to coat them. Now transfer them to the hot oil and fry them to a golden brown. This goes very quickly so be very attentive. Carefully transfer the fried walnuts to the prepared baking sheet, making sure that they do not touch and are in a single layer. Cool them and dry them before serving. Cut the lettuce in sections length-wise. Wash the sections in cold water and spin them dry. Just before serving toss the lettuce and the red onion slices with the dressing and tasting it for enough salt. If it needs more salt add a sprinkle over the lettuce. Add the grapefruit sections and tuck them into the fold of the lettuce. Break up the walnut halves and sprinkle them over the salad. Do you have a favorite Guacamole recipe? Send me your comments……I would love to hear from you!!! What a great story Maria! Thank you, I love food history & I too grew up with Hass avocados growing in my backyard but we used them all! I remember my grandmother using them in everything! She even smashed them with a little salt & pepper then spreading the mash on buttered toast, still one of my favorite treats. 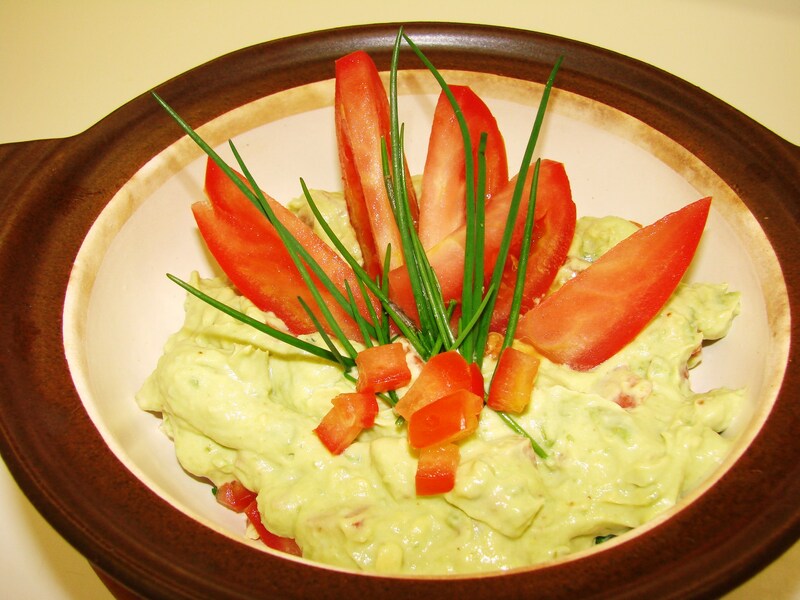 If you add a cooked tomatillo or two to your guacamole, it will keep it green and not affect the taste. A little tip I learned @ Melissa’s! Hi Debbi………I will try your buttered toast with mashed Avocado………..it sounds just what I would like for lunch!!! Thank you for sharing your memories of your grandmother……..and the trick with cooked tomatillo is great to know…….and it certainly is most interesting! Thank you for your lovely comment………..
On an another note……..Will you be teaching in the Paso Robles, San Luis Obispo, Moro Bay area….next week? I will be in Paso from March 28th to April 5……. Loved the story. Isn’t funny when we don’t know what something is used for? We have had many Japanese students over the years stay with us. I have more than once found whole artichokes in the trash as the girls didn’t have a clue how to eat them. 🙂 Once they found out you peel each leaf and dip in a Japanese fav mayo they devoured them everytime they could. Did you knoww avocados do not begin to rippen until picked? The avocado, a fruit is very popular in SE Asia. It makes amazing ice cream, shakes, and such. To me there is nothing as wonderful as an avocado in a salad, or stuffed with fgresh Dungeness Crab. Our avocado died a couple of years and we were so sad as it had just begun to produce fruit the year before. We are borderline for growing them as we get too cold in the winter. Fortunately they only cost $1.00 or less here. My favourite BLT is really a BLTA=applewood smoked bacon, butter lettuce, slice of heirloom tomato, + a nice ripe avocado slice all on a mayo slathered sourdough bread that is lightly toasted!!!!YUMMO!!! BLTA is a Cali favourite! Hi Mary-Anne………so nice to hear from you …and as always so full of information and a wonderful story. I will be in Paso Robles this next week…….any chance that you might be there as well……since you travel so much???? Unfortunately that is quite a drive from here for a day trip. Maybe you will get to the SF Bay Area!!!! I love your stories Maria. I’m going to try the Avocado Spring Salad, it sounds delicious! Hi Alicia………so happy to hear that you will try to make the Avocado Spring Salad………it sounds really wonderful. I have not actually made it……but, thought that it was easy enough and old enough that we could all try it………..
See you in church on Sunday…. I continue to be in awe of your posts! What fun to read your stories. Thanks for sharing such great recipes. Hi Julie………..thank you for your nice comment……..I always LOVE to hear from you………..you boost me up every time!!! Love and hugs to you……….. Marvelous post, Maria! Like you, I met the Hass later in life. Thank you for teaching this old dog some new avocado tricks. Actually I LOVE old recipes…….and thought it might be fun listing them in this blog. Hi Betty Ann………..I am working slowly on my book and will have to pick up the “movement” as you say. I did not like this winter at all………I felt I had no energy, but things are improving with every sunny day now. It was just too cold…………..
We have been traveling and I am leaving for CA this coming Tuesday for a week……..When I get back I have to concentrate on my book……..
About IACP………I will not be in Austin this year. We will be traveling in Florida for 3 weeks in June………and things just got to be too jammed……for that month. I have not heard a word from Jayne this year…..hope she is okay………. Thank you for your very nice comment about my writing…….You are so encouraging all the time………. What a wonderful article on avocados. I adore them. I have to admit I didn’t for many years. My mom used to make shrimp salad and put it in the center of a halved avocado and I wouldn’t eat it. Not one bite. Now I would eat it – anytime. The recipes look amazing. Thanks for sharing them. Hi Risa………..so good to hear from you!!!!!!!!!!!! I love these OLD recipes……and they still serve shrimp salad in avocado halves in California. My family lives in Paso Robles and my parents had retired in Cayucos……they are not with us any longer…….but, there was a little restaurant an the pier…….and they had the BEST shrimp salads which they served in a half avocado……….. I will be with my family next week and will visit my parents’ grave………and will stop by at this little restaurant for lunch… hope they still serve that shrimp salad………! Will Ross and I be seeing you and Dale at the SBHS 50th reunion? Hope so! Hi Maria, peccato that you threw those Haas avocados away! I miss them here in Italy. They are not an Italian tradition, though it certainly would be possible to grow them here. We do get the thin skinned type from Israel, but they are just not the same for guacamole. . . Thank you for the comment……..I am eating a Hass every day now………hoping to lower my LDL………….. I will not be going to Austin this year as well……..we have too many things going on in June……that I want to participate together with Dale………and his family! Loved this blog….I adore avocados!! I was recently at a Shabbat Orthodox dinner and was served guacamole on fresh challah bread—it was delish! I plan to serve some with matzoh on Passover! I love this story. It made me giggle. Thanks, Maria, you are making me HUNGRY!! I love your post, most carefully researched and informative as usual. Avocados are such a treat here in Europe and I remember when I lived in California, what a delight it was to go to the open farmer’s market in Santa Monica and buy fresh produce which included delicious creamy avocados. I love your childhood story about the tree…and can relate to this. I recall my very first trip abroad when I was younger. My then husband and I visited France and it was during a lunch in Monaco, that we ordered ‘crudites’. We had never seen an artichoke before and Mark approached his tentatively with a knife and fork, whilst I was halted in my tracks by the sight of two gentlemen on another table who burst into laughter as he did so. Alerted to the faux pas, I waited for direction which arrived via the kind gesture of the very same men who proceeded to inform us by exampole, having ordered the same. Thankyou again Maria for bringing such versatility to this speciality. Thank you for your lovely comment and the interesting story that came with it………yes, we all have experiences when we travel in foreign lands………and all these experiences make us the person we are …….full of knowledge of others while taking on some of their idiosyncrasies that make us such complex individuals. Love and hugs to you…..always……. Your blog on avocado brought such memories to me, Maria. In the 60s, I was part of a gourmet group at U.C. Davis and the Vincent Price cookbook was a favorite for us all. I love your writing and recipes. Thank you for keeping me on your list! Happy spring! Loved the blog on Avocados! This is a fun read, Maria — thanks for keeping in touch. Yep! My dad also used to call them alligator pears! Cute! I hear you will be out here in California soon, I hope we can have a cup of tea or something together while you are out here! ahhh Vincet price’s cookbook is what got my husband cooking back in the mid 70’s!!!!! Still an amazing book. Mary-Ann……… I have a copy from 1967 that I found in a bookstore of “used” books several years ago………they also had one from the first printing……that sold for nearly $100…..I did not purchase it……….. I rally love this book! Then followed Larousse Gastronimque and Gourmet’s 2 vol set, then on and on. These were the ones that got Steve cooking. Now his favourite are French Laundery, Boucheron, Ad Hoc and all of Carlie Trotter’s books. He uses Peterson’s Sauce book also. He is far more classical in his cooking than moi. I started cooking with the Time Life “Foods of the World” series………..
Now I do not even know how many I have…………. Hi Christo…………so good to see you on my blog!!!!!!!!!!!!!! Yes, I have to make some pastry with Avocados! It is such a mild fruit that one can substitute if for butter ….almost! Cakes like Banana Cake could be easily be made with Avocados instead of Bananas. You know I have not thought about it until I wrote this story in this blog. I will definitely have to have a followup story about Avocados soon…………. Thank you for sharing your experiences with with me……….. Such an interesting article about avocados. Love the history as well as the recipes. It’s one of my favorite foods. Also love avocado oil. Avocado and bean sprout sandwiches. Toast 2 slices of multi grain bread. Spread with a majo/red pepper puree spread. Top with sliced avocado, bean sprouts, lettuce and shredded carrots dressed with lemon or lime juice, olive oil and a bit of ground pepper and a dash of kosher salt. A healthy light lunch. Can also be made as an open faced Tartine on grilled baguette or sour dough bread. Perfect for all you want to cut down on sandwich meats and nitrates. Enjoy with a glass of freshly made lemonade. Yuuuuuummmmmmmmmmm! Hi Anna……..thank you for this yummy, healthy sandwich recipe……….I eat veggie sandwiches for lunch most of the times……..and sometimes even for dinner…….. This will be a nice addition to my daily menu………..
Molim Maja i dobar tek! I have an avocado cheesecake recipe of you want that. also what is the yummy somekind of a roll with somekind of cheese filling and what looks like cinnamon butter on top? Can I get the recipe?